Showing items in category Nauru, sorted by newest listed first. NAURU - 1935 3 1/2d rate cover to USA bearing 'Silver Jubilee' adhesives. 1935 (JE.12.) 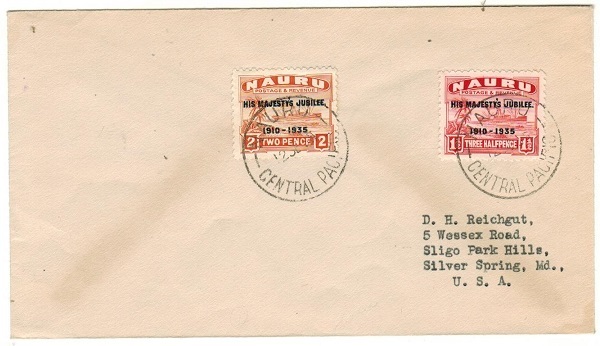 cover addressed to USA bearing 1 1/2d and 2d 'Silver Jubilee' adhesives (SG 40+41) tied NAURU/CENTRAL PACIFIC. NAURU - 1917 4d rate registered cover to Australia used at PLEASANT ISLAND. 1917 (OC.12.) registered cover to Australia bearing 2d adhesive pair (SG 4) tied by PLEASANT ISLAND/NAURU cds with magenta boxed R/PLEASANT ISLAND/NAURU/No. handsatmp at lower left. NAURU - 1917 1d rate cover to Australia used at PLEASANT ISLAND. 1917 (FE.2.) cover addressed to Australia bearing 1d adhesive (SG 2) cancelled by P.O.PLEASANT ISLAND (NAURU) cds. SYDNEY/NSW roller arrival b/s. NAURU - 1919 multi franked 'CENSORED' registered cover to Switzerland used at PLEASANT ISLAND. 1919 (JA.1.) registered cover to Switzerland bearing 1/2d, 2d and 5d adhesives (SG 1,4 and 9) tied by PLEASANT ISLAND/NAURU cds's with magenta straight lined CENSORED h/s at right. NAURU - 1919 multi franked registered cover to UK used at PLEASANT ISLAND/NAURU. 1919 (AP.9.) registered (Wilson) cover to UK bearing 3d,4d,5d and 6d adhesives (SG 7-10) tied by PLEASANT ISLAND/NAURU cds with violet boxed R/PLEASANT ISLAND/NAURU/No. handstamp at lower right. NAURU - 1919 9d+1/- adhesives on registered cover to UK used at PLEASANT ISLAND/NAURU. 1919 (AP.9.) 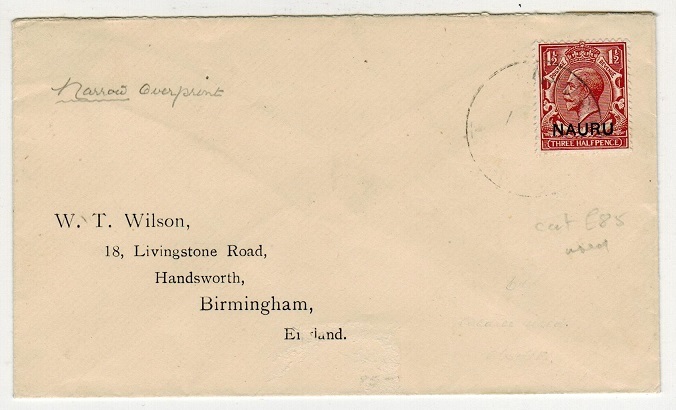 registered 'Wilson' cover to UK bearing 9d and 1/- adhesives (SG 11+12) tied by P.O.PLEASANT ISLAND/NAURU cds's. Scarce top values on cover. 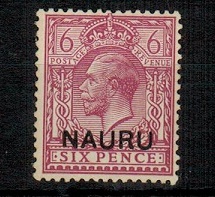 NAURU - 1916 6d purple U/M with SHORT N variety. SG 10. 1916 6d purple in fine unmounted mint condition (just the hint of tone on perf edges from this chalk surfaced paper) and showing the SHORT N variety. Row 1/8. SG 10. 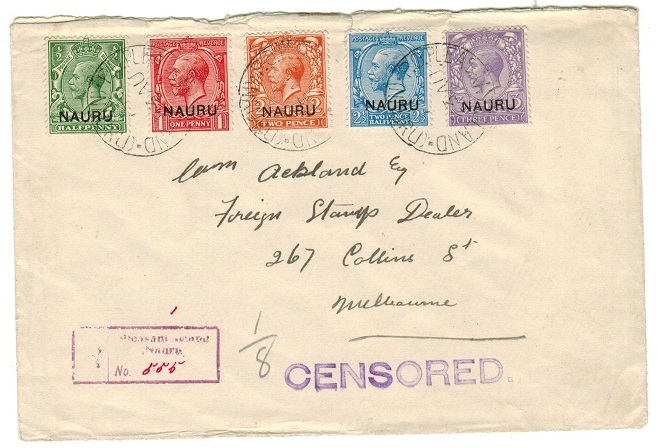 NAURU - 1917 (circa) multi franked CENSORED cover to Australia. 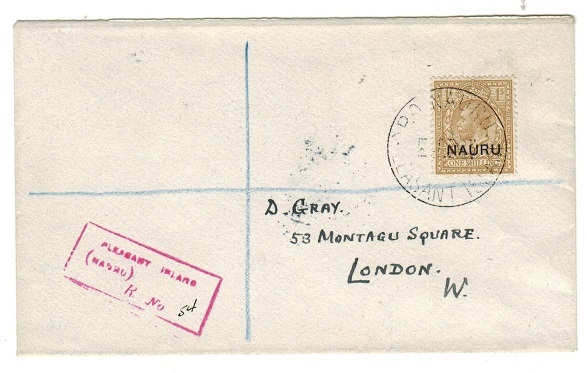 NAURU - 1923 1/- rate registered cover to UK used at PLEASANT ISLAND. 1923 (FE.5.) 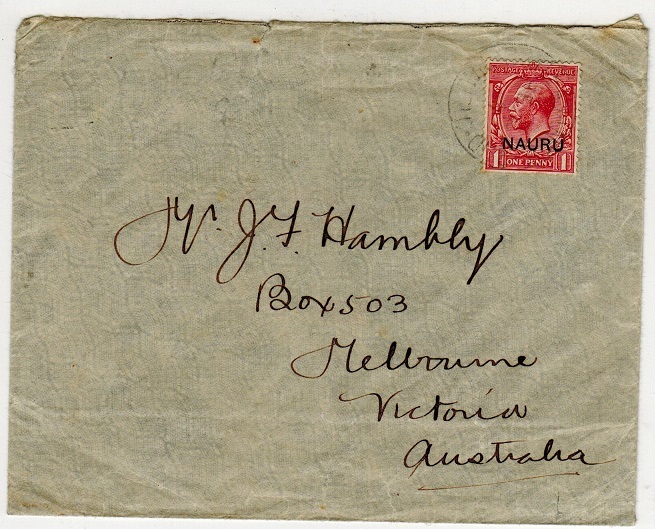 registered cover addressed to UK bearing 1/- bistre-brown (SG 12) tied by GPO NAURU/PLEASANT ISLAND cds with red boxed PLEASANT ISLAND/(NAURU) registered h/s at lower left. SYDNEY transit and UK arrival. NAURU - 1916 1d bright scarlet mint with SHORT LEFT LEG OF N variety. SG 2. 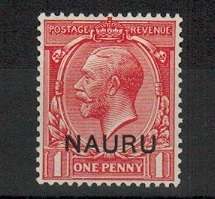 1916 1d bright scarlet in fine mint condition showing the SHORT LEG OF N IN NAURU variety. Row 1/8. SG 2. 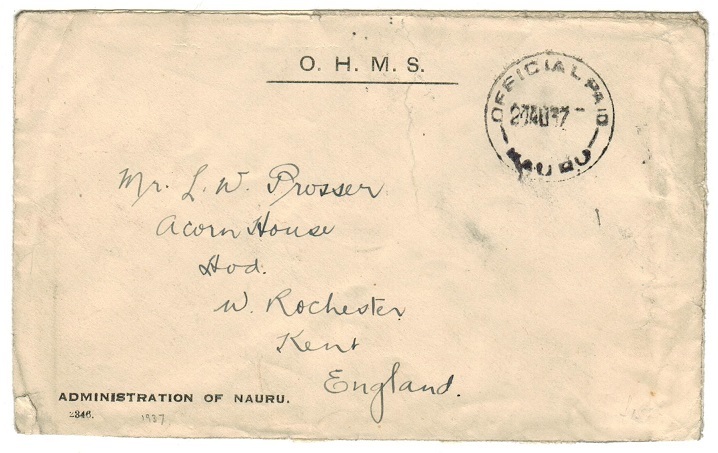 NAURU - 1917 registered censored cover to UK. 1917 (DE.30.) 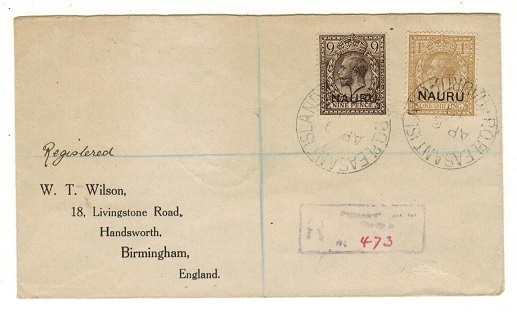 registered 'Wilson' cover addressed to UK bearing 1/2d and 1d pairs tied by PLEASANT ISLAND/NAURU cds's and struck by scarce bluish CENSORED h/s at left. NAURU - 1923 cover to UK with rare 1 1/2d red-brown (SG 3) usage. 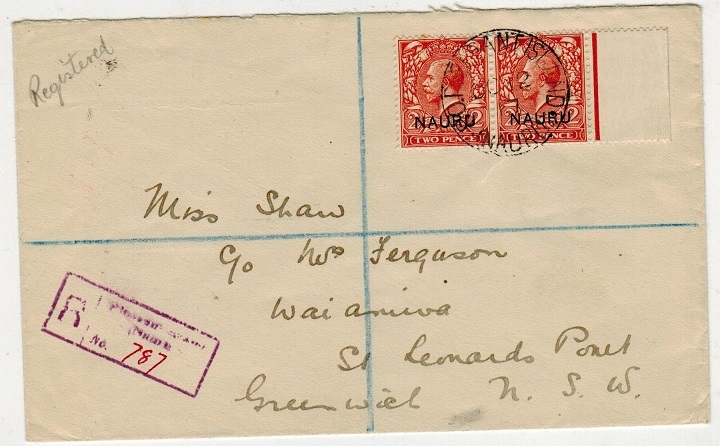 1923 (circa) 'Wilson' cover addressed to USA bearing the scarce 1 1/2d red-brown adhesive (SG 3) tied by NAURU cds but unfortunately a weak strike and not showing the dating. A very scarce stamp on cover never the less. NAURU - 1968 'S.S.ORCADES' maritime cover to UK. 1968 (MAR.9.) 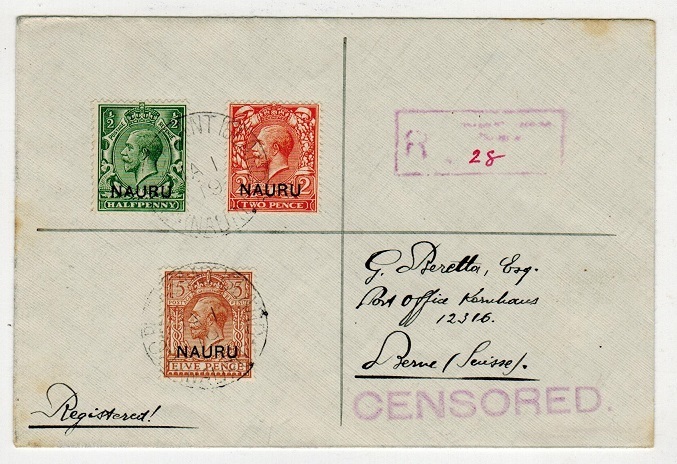 cover addressed to UK bearing 1c 'Republic of Nauru' overprint strip of three tied with 2c adhesive by CRISTOBAL C.Z.PAQUEBOT cds with creasted S.S.ORCADES maritime strike at lower left. 1965 (DE.2.) 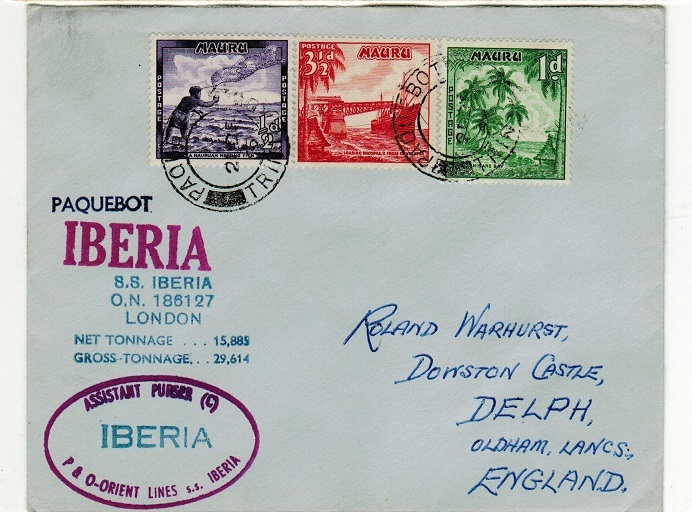 cover addressed to UK bearing 1/2d, 1d and 3 1/2d adhesives tied by PAQUEBOT/ TRINIDAD cds with oval IBERIA/P & O ORIENT LINES maritime handstamps at lower left. NAURU - 1919 registered cover to USA used at PLEASANT ISLAND/NAURU. 1919 (AP.9.) 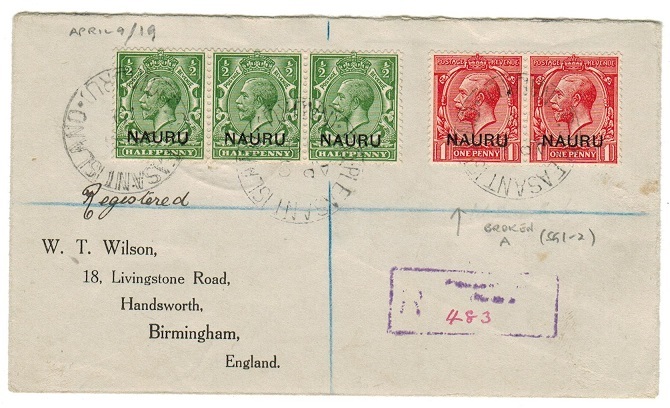 registered cover addressed to UK bearing 1/2d strip of three (SG 1) and 1d pair (SG 2) latter showing the BROKEN A in NAURU cancelled by PLEASANT ISLAND/NAURU cds's with magenta R/PLEASANT ISLAND/NAURU/No h/s below. 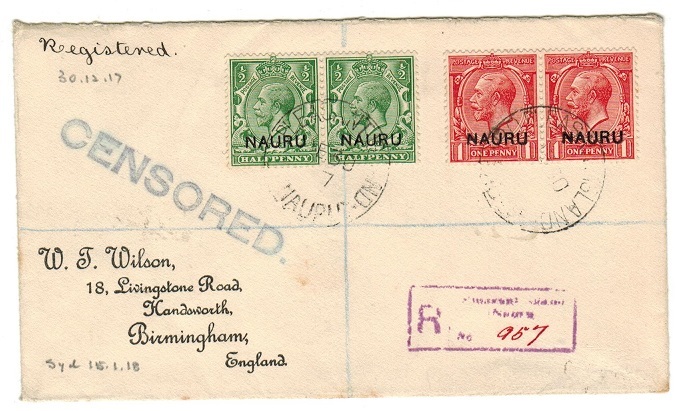 NAURU - 1935 2 1/2d rate cover to UK. 1935 (FE.19.) 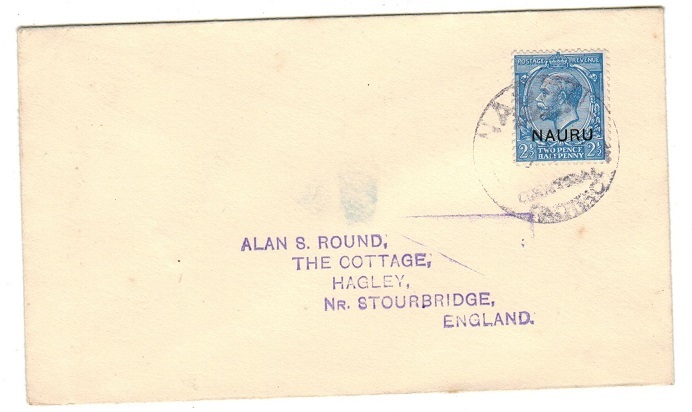 cover addressed to UK (Round) bearing the 2 1/2d blue adhesive (SG 6) cancelled by the rubber NAURU/CENTRAL/PACIFIC cds (Buckingham type P4) notoroius at this time for having the '3' in year slug missing. 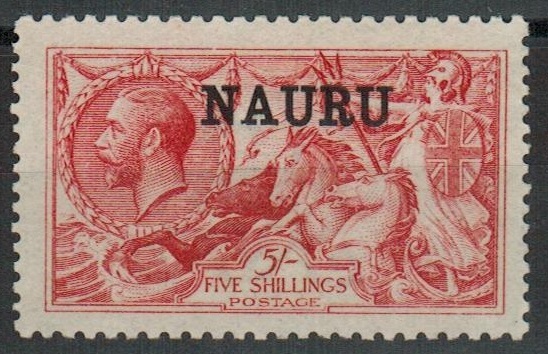 NAURU - 1935 2d rate cover to UK. 1935 (FE.19.) 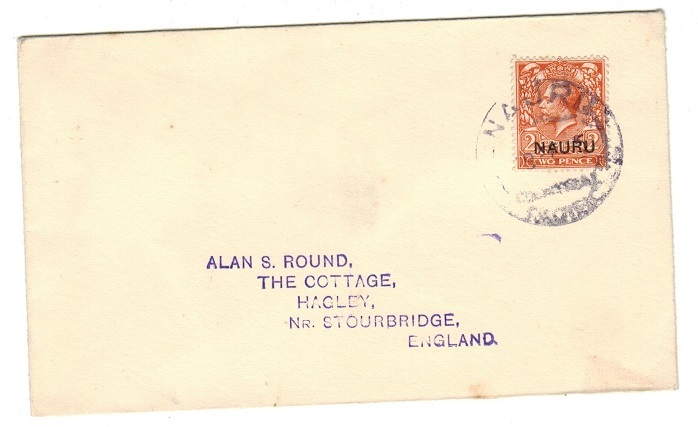 cover addressed to UK (Round) bearing the 2d orange (SG 4-die I) cancelled by the rubber NAURU/CENTRAL/PACIFIC cds (Buckingham type P4) notoroius at this time for having the '3' in year slug missing. 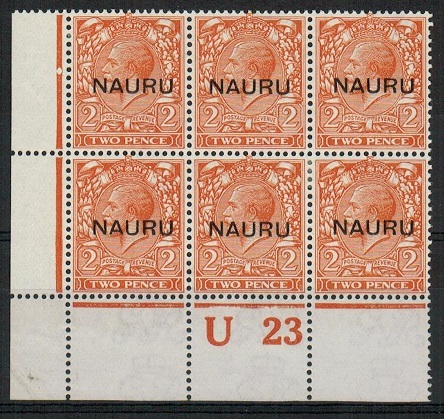 NAURU - 1923 2d (die II) mint 'U 23 (P)' control block of six. SG 16. 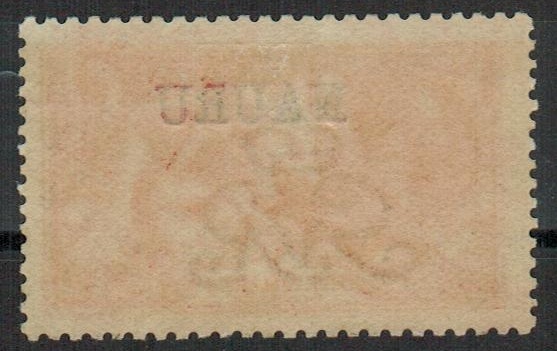 1923 2d orange (die II) issue in a fine mint corner marginal block of six with "U23 (P)" control in lower margin. A rare block. SG 16. 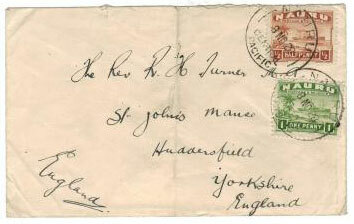 NAURU - 1937 OHMS envelope to UK cancelled OFFICIAL PAID/NAURU. 1937 (AU.24.) stampless use of small sized O.H.M.S. (Administration Of Nauru) cover addressed to UK and cancelled by OFFICIAL PAID/NAURU cds in black. Buckingham type 04. NAURU - 1916 5/- 'DLR' seahorses mint and used. SG22. 1916-23 5/- carmine 'seahorses' in unmounted mint condition and fine used. The latter with nibbled perf at top. (2 stamps). SG 22. NAURU - 1916 1d bright scarlet mint with SHORT LEFT LEG TO N variety. SG 2. 1916 1d bright scarlet in mint condition with hinge remains but showing the variety SHORT LEFT LEG TO 'N' from Row 1/8. SG 2. 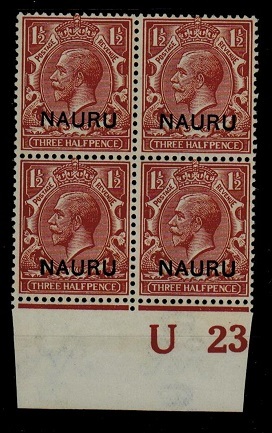 NAURU - 1923 1 1/d red-brown U/M plate 'U 23' block of four. SG 3. 1923 1 1/2d red-brown adhesive in a fine unmounted mint block of four showing the scarce plate 'U 23' in bottom margin. A very rare piece with plate number. Few recorded. SG 3. NAURU - 1973 30c 'Catching Noddy Birds' progressive IMPERFORATE PROOFS. 1973 30c 'Catching Noddy Birds' adhesive (SG 110) in six left hand marginal IMPERFORATE PROOFS showing four examples of the different colours used plus the black print showing the name and value tablets and a copy of the finished issued stamp but imperforate. (6 proofs). 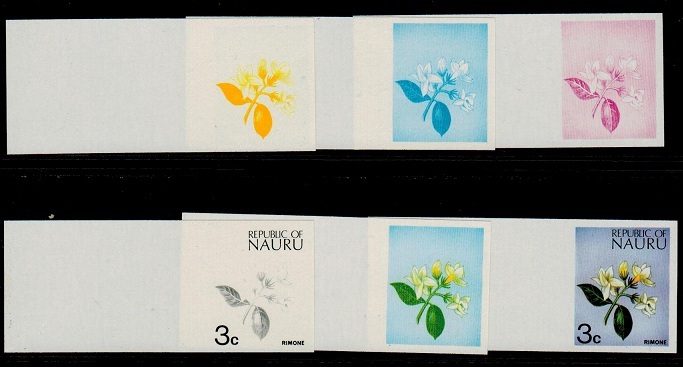 Ex Format Ltd.
NAURU - 1973 3c 'Rimone' progressive IMPERFORATE PROOFS. 1973 3c 'Rimone' flower adhesive (SG 101) in six left hand marginal IMPERFORATE PROOFS showing four examples of the different colours used plus the black print showing the name and value tablets and a copy of the finished issued stamp but imperforate. (6 proofs). Ex Format Ltd.
NAURU - 1973 2c 'Rimone' progressive IMPERFORATE PROOFS. 1973 2c 'Rimone' flower adhesive (SG 100) in six left hand marginal IMPERFORATE PROOFS showing four examples of the different colours used plus the black print showing the name and value tablets and a copy of the finished issued stamp but imperforate. (6 proofs). 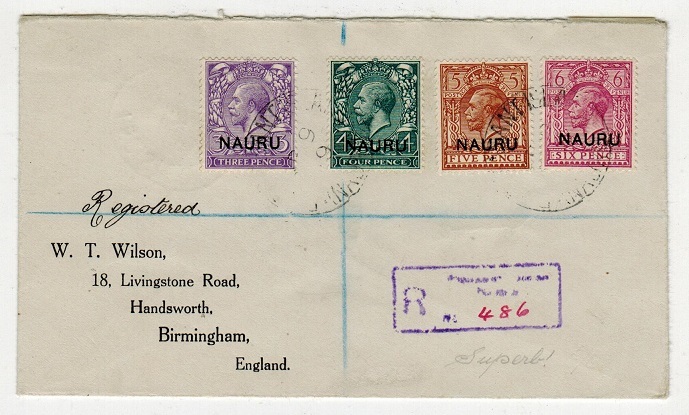 Ex Format Ltd.
NAURU - 1928 cover to UK. 1928 (NO.8.) 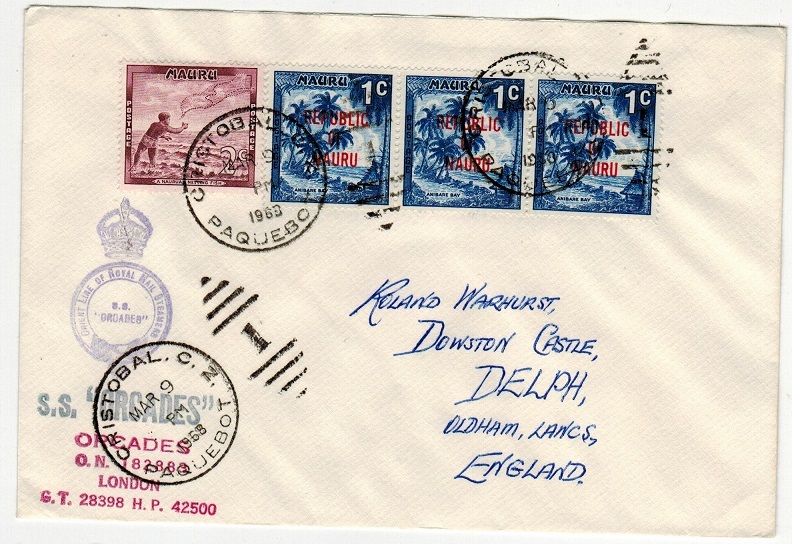 cover addressed to UK (central fold) bearing 1/2d and 1d 'yacht' adhesives tied by NAURU/CENTRAL PACIFIC cds's. NAURU - 1916 5/- DLR seahorse mint. SG 22. 1916-23 5/- Bright carmine. A very fine lightly mounted mint example. SG22.